Founded in 1982, Sistema Guals®is an Agrifood Software that covers the IT needs of production, costs and food traceability to small, medium and large businesses. Sistema Guals® is developed from the knowledge, experience and needs of the sector. It is a constantly evolving System where improvements are incorporated in response to user feedback, and it is characterized as a living system to adapt to current needs, internal control as demands from the Administration to meet current standards. Guals Group has grown with new departments within our company, therefore, Guals group is getting stronger and we can well meet with greater satisfaction our main goal, to satisfy our user by offering new and improved services daily. Nowadays we operate our offices in Madrid and Barcelona, ​​with a group of highly qualified computer technicians and experts of the sector. 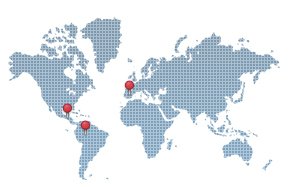 In addition we operate franchises Sistema Guals® in Central and South America. The talent of our team adds an extraordinary capacity for innovation, we seek to place Sistema Guals® as a leader Agrifood Software. In Guals Guals we continuously look for talented people to join our team.